2013 The Year Plug-In Hybrids Become Mainstream? 2012 has brought the best and sometimes the worst from plug-in hybrids. A stepping stones to electric cars or just another market segment? 2013 Audi Q5 Hybrid. The hybrid Q5 which should be arriving late 2012 should give you a 208 hp through a turbocharged 2L, 4 cylinder engine getting some help from a 44 hp electric motor. 8 speed automatic transmission, front wheel drive, this hybrid should give you a combined 30 mpg at around $42,000. 2013 Ford C-MAX Hybrid which is ready for purchasing. Ford here uses its hybrid platform giving it an EPA estimate of 47 mpg combined. With 188 hp of gasoline engine and electric motor, this car can travel 570 miles on a single tank of fuel. A 62-mph top speed can be achieved in electric mode or 15 mph at lower speeds. It starts at $25,995. 2013 Ford Fusion Energi. This is the Fusion plug-in hybrid version using the same the C-Max hybrids platform, a 2L, 4 cylinder Atkinson-cycle engine with an electric motor for 188 hp. The Fusion will give you around 100 MPGe fuel economy. 2013 Ford Fusion Hybrid. Already available, the hybrid version of the 2013 Fusion delivers 47 mpg in combined driving. 2013 Toyota Avalon Hybrid. Next year’s newest hybrid is the industry's first full-size hybrid sedan using a 2.5L engine with a pair of electric motors to produce 200 hp with a fuel economy of about 40 mpg in the city and 39 mpg on the highway. You will be able to drive 1.5 miles on electricity alone at up to 25 mph. 2013 Volkswagen Jetta Hybrid. Technically here now, VW's first hybrid uses a new 150 hp turbocharged 1.4L engine with a 27 hp electric motor drawn from a tiny 1.1 kWh lithium battery. With its seven-speed dual-clutch automated manual transmission it is expected to yield around 45 mpg combined. In "E" mode (electric), it will give you 1.3 miles of travel at up to 44 mph. 2014 Honda Accord Plug-in Hybrid will give you a 134 hp, 2L engine using a 161 hp electric motor with a 6 kWh lithium-ion battery pack. The combined horsepower is 193 with 226 lb-ft of torque. The second electric motor can become an onboard generator and the engine doesn't engage the wheels until it reaches above 40 mph. 2014 Honda Accord Hybrid. This is a conventional hybrid, using the plug-in hybrid's gasoline/electric drive system with a smaller battery charged only by regenerative braking. 2014 Mercedes-Benz B-Class E-Cell Plus. This plug-in hybrid will use a 3 cylinder gasoline engine with a lithium-ion battery pack to provide about 60 miles with electricity alone before the engine kicks in. It should yield 300 miles. 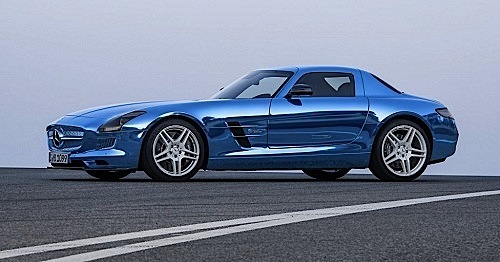 2014 Mercedes-Benz SLS AMG E-Cell. This very limited-production electric supercar will generate 525 hp with 649 lb-ft of torque via its 4 in-hub electric motors. The 48-kWh lithium-ion battery pack will help the Mercedes shot form 0 to 60 in less than 4 seconds. 2014 Mitsubishi Outlander PHEV. Mitsubishi will be the first to market a plug-in hybrid SUV, the Outlander PHEV. It will have an all-wheel-drive drivetrain using electric motors and a gasoline engine. This is the best of all worlds. 2014 Nissan Altima Hybrid. Nissan will have its very own Hybrid technology it will put in the Altima. This front-wheel-drive could give birth to a supercharged 2.5L engine and a single electric motor that should yield 270 hp and around 40 mpg. 2014 Subaru Hybrid. Finally Subaru's first hybrid should have an all-wheel-drive system, using a gasoline-electric powertrain most likely based on the company's 2L flat-4 engine. 2014 Volkswagen Golf Blue E-Motion. Using an electric motor delivering 199 lb-ft of torque powered by a 26.5-kWh lithium-ion battery will store, this EV should give you 93 miles. Hybrids have done well and it is about time we see more plug-in hybrid step up to the plate. The freedom of using electricity when we want and gasoline only when needed with a plug-in hybrid will be a welcome addition for many.